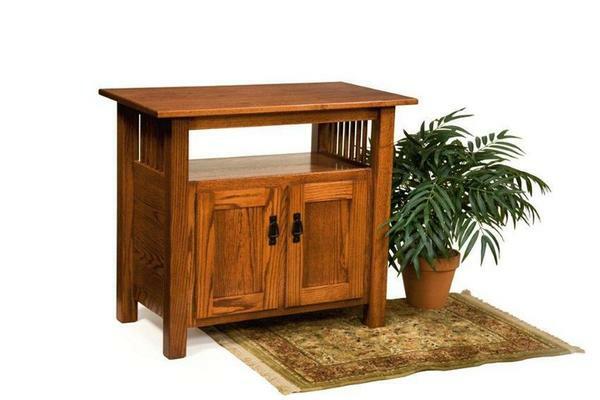 Simply beautiful for your bedroom, living room, family room or den, the Amish American Mission TV Stand provides a solid wood design that is sure to entertain. A 35" width holds your television securely as you gather with loved ones to enjoy your favorite programs. This mission style furniture adds a special feature to any room, combining exceptional solid wood construction with a trusted mission design that never goes out of style. Shaped to exude warmth throughout the room, this mission TV stand features the popular mission slats on the sides as well as thick squared legs that speak to the quality of the solid wood you select. Gorgeous cabinet doors open to a spacious compartment to hold your favorite movies and TV programs on DVD. The open shelf makes space for your DVD player, keeping your entertainment items displayed nice and neat with no clutter in sight. This mission furniture is shown in oak wood with harvest stain. Oak wood is warm and inviting; a great choice for a relaxing living room or bedroom. Oak furniture features a heavily defined grain pattern, allowing you to see and enjoy the beauty and natural quality of fine solid wood furnishings.